I've been able to create a few last things with the December Vintage Winter kit from Swirlydoos featuring the Bo Bunny Winter Wishes collection; I'd like to share them with you. This tag was created from some leftover stripes and a cut-apart. Also from the kit are the DIY Chalkboard Clothespin and the dollop of Aleen's Glitter Snow. The Darice silver bling is from the November kit (I kept it out just knowing that I'd need it! ); the Prima resin frame and the pretty snowflake trim are from my stash. 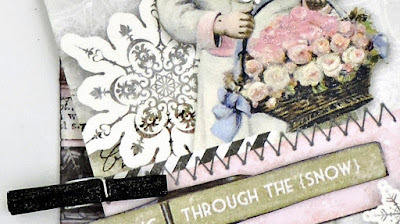 I used a Wink of Stella pen to add a little shimmer to the clothespin and wings and basket of flowers. It doesn't show up that well here, but up close, it's so pretty!!! Another tag - this one with a woodlands feel contains more bits and pieces layered and tucked under. The frame is from another cut-apart. 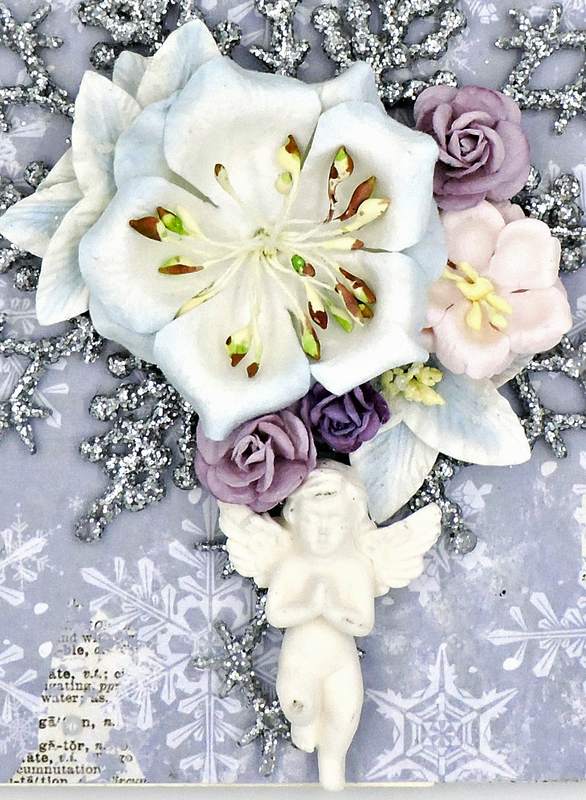 I've added the flowers and a butterfly from the package of Prima Melody collection flowers and a few of the Darice Rusted Jingle Bells. 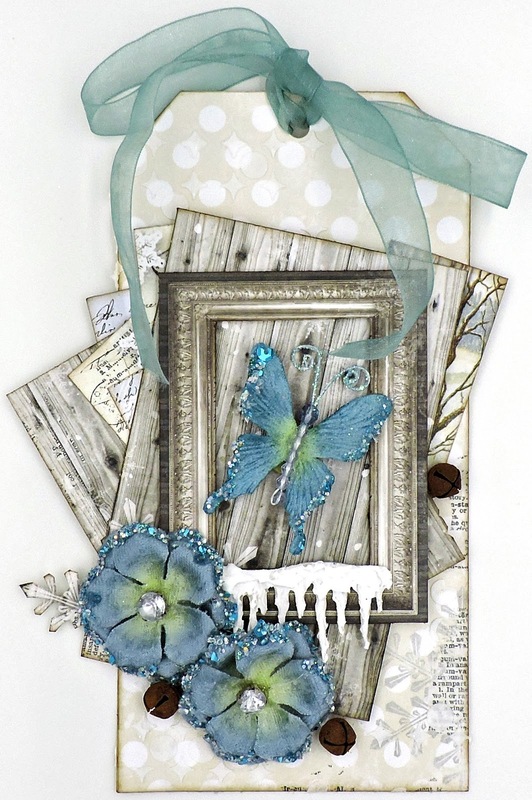 The icicles (cut on my Cameo and covered with Aleen's Glitter Snow) are leftover from my Winter Memories page. The sheer trim is from my stash. 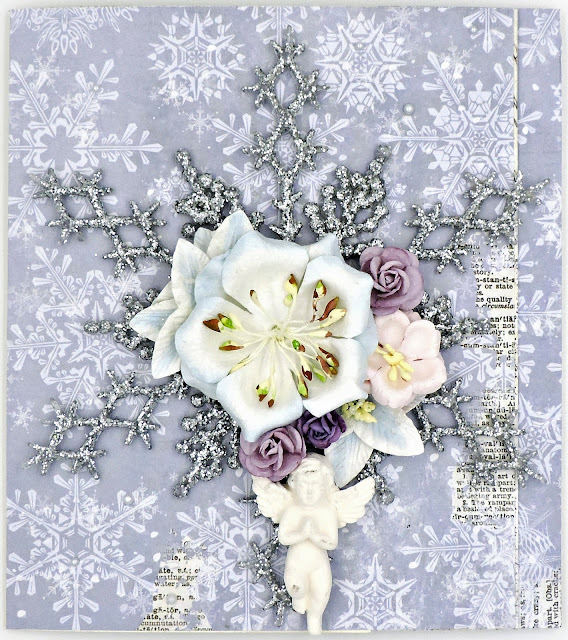 I had put this gigantic (6" x 6-1/2") silver snowflake by Darice aside, intending to use it for a Christmas ornament, but in the end I decided that it would be fun to use it on a card. I took a 12" x 12" piece of cream cardstock, cut it down to 11" x 6-3/4" and scored it at 4" and 10". Next, I cut some pieces from my scraps: from the Magic sheet 1 @ 5-3/4" x 6-3/4" and 1 @ 6" x 6-3/4" and 1@ 5-3/4" x 6-3/4" and 1 @ 2" x 6-3/4" from the Whimsy sheet. With the cardstock open to the inside, I glued the 6" Magic sheet to the middle section and the two Whimsy pieces on the sides. (The larger of these will overlap the cardstock; this is how I was able to make a card that actually opens to 13-3/4".) I turned the card over with the front facing and glued on the 5-3/4" Magic sheet, covering the cardstock and the exposed back of the Whimsy paper. 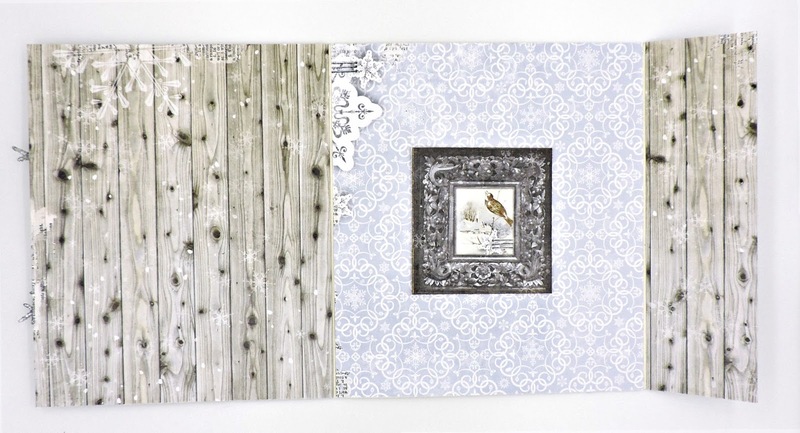 I used a cut-out featuring a winter songbird to decorate the inside of my card and to give it a bit of a pop. And now for the front - I used Fabri-Tac to glue on the snowflake, letting it overlap the opening edge and then I scattered a few of my remaining Kaisercraft self-adhesive pearls here and there. I took out some of the 49 and Market blooms that came in the November Flower Add-On and this so sweet angel (a gift from Rae Moses) and arranged them until I was happy with the result.